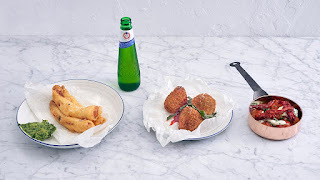 The House of Peroni, Peroni's celebration of Italian food, drinik and culture, returns to London on Thursday 19th May for a six week run, this time at Proud East (formerly The Proud Archivist), on the Regent's Canal near to Haggerston. Expect lots of interesting thngs to see, plus lots of great food, including an Italian spin on the classic weekend brunch, and Italian feasts three times a week, plus great beers and cocktails, and lot of (bookable) classes to improve your mind. "The House of Peroni is making a triumphant return to the capital this summer with a six week long Residency at Proud East in Haggerston, East London. Entitled ‘Amare l’Italia’ – meaning ‘For the love of Italy’ – The House of Peroni Residency will welcome guests through its doors from Thursday 19 th May – Friday 1 st July. An Italian version of the British brunch will be served every Saturday and Sunday between 11am and 3pm, accompanied by acoustic sounds from Italian-inspired bands and a delicious Peroni Nastro Azzurro infused citrus punch. Stand out dishes include Purgatorio (spicy baked eggs with njuda), Gratin di Asparagi (gratin of asparagus with duck eggs and Grana Padano), Mac e Carbonara (mac and cheese carbonara), along with the show-stopping Un Colpo All'Italiana – translated as the ‘Italian Job’ – a delicious Italian take on the full English. All dishes are perfectly accompanied by La Regina Mary (Queen Mary) – a new savoury expression of the traditional Bloody Mary, made with Parma ham. A pre-bookable private dining event will take place three evenings a week, where guests will be invited to sit together and enjoy a sumptuous Italian feast, inspired by the family gatherings Francesco grew up with in the southern Italian region of Calabria. The feast features his ‘Mezzogiorno’ signature cooking style and includes an impressive array of antipasti dishes, including Salame all'Anatra (home cured duck salami with cherries), Battuta di Salmone (a salmon dish, akin to a tartare) and Insalata di Carciofini (artichoke and pea shoot salad). Melt in the mouth, tortellini filled with the softest burratta is followed by liquorice-cured baccala (salt cod) and magnificent roasted lamb. Dessert is a fragrant Crema al Bergamotto (bergamot cream) served with cherries and a selection of handmade pasticcini (fine Italian pastries). A bespoke series of events including mixology classes, Italian culinary masterclasses and private dining experiences will be on sale via The House of Peroni website."